When people think of Cambodian history, a few words usually come to mind: “Killing Fields” and “Khmer Rouge” top the list. After decades of impunity, the time has finally come for the ex-leaders of the Khmer Rouge to answer for their genocidal crimes. Today I'm see a truly historical event. I'll be watching a trial for the most serious crime of all: Crimes against humanity. I'm attending this historical trial with my friend Sue, another American living in Cambodia. We arrive by tuk-tuk on the edge of Phnom Penh, and enter the ‘Extraordinary Chambers in the Courts of Cambodia’, (ECCC) an impressive judicial complex built solely for these trials. A large new yellow building with a Khmer style roof holds the courtroom. This complex also has a jail for those accused, so it's surrounded by a fence topped with barbed wire. We enter through metal detectors; cell phones or cameras aren't allowed. (Darn!) Walking in, I find the room very wide, with blue movie theater style seats for those watching. It looks more like an auditorium than courtroom. Attendance is low; I count only about 115 people, mostly foreigners. More Cambodians attended in the beginning, but as these trials are a long, slow process, fewer attend these days. The audience is separated from the proceedings by glass. I wonder if it makes those inside feel like zoo animals. That’s not far off, considering those that are on trial. The glass is very thick, and I wonder if it’s bulletproof. There are many in Cambodia that would like to kill the defendants themselves, along with their lawyers. What Hun Sen fails to mention, is that during the genocide, he was a Khmer Rouge commander! 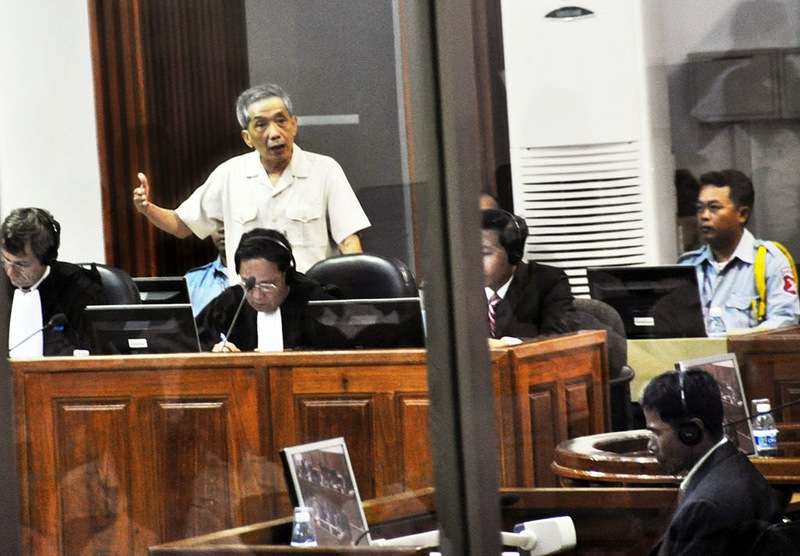 His former membership in the Khmer Rouge is believed to be one reason why these trials were delayed for years. It hasn't been proved that Hun Sen took part in war crimes during the Pol Pot era, but it hasn't been disproved either. The only reason these trials came about, was through international pressure. Hun Sen’s government couldn't hold fair trials on their own, and he also refused to allow the trials held at the International Criminal Court in the Hague, where it would have cost less. The Cambodian government demanded the trials held here, and cynics say that this was so the Cambodian government could make money off the trials. To ensure fairness, the international community demanded that a few foreign judges be included. 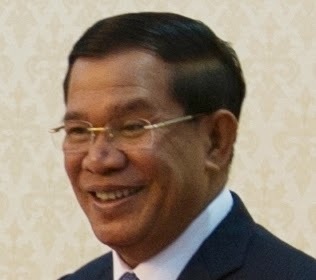 As a result, the presiding justices are a mix of Khmer, and foreign judges. On entering, I’m handed a headset and receiver to listen to the translations. Flags of the United Nations and Cambodia hang flat on the wall, with the ECCC seal in between them. Looking at the participants, all lawyers and officials are wearing purple or black robes. Off to the right, seated alone, is an older Cambodian. I quickly recognize him. It's hard to believe it, but there he is. I almost gasp. Duch was the warden of S-21, also known as Tuol Sleng, the former prison and torture center that I had visited. This man is responsible for the murder of 17,000 Cambodians, and he's seated less than 30 feet away from me! I'm surprised to see that he’s so short. For a man who was one of the 20th century's biggest terrors, he’s really rather small. He wears a white short sleeved dress shirt, and he’s a little chubby. Unlike his former captives, he’s not going hungry in prison. He's been getting fat on ECCC prison food. Duch is not his real name. Like most wartime Khmer Rouge cadres, he changed his name when he joined the radical movement. His real name is Kaing Gueck Eav, born in 1945 in Kampong Thom Province. A gifted math student, he once won 2nd place in a national mathematics contest. He later became a math teacher, joining the Communist Party in 1970. In the 1980’s he left the Khmer Rouge and disappeared. A western journalist found him in the 1990’s, and he was finally arrested in 1999. 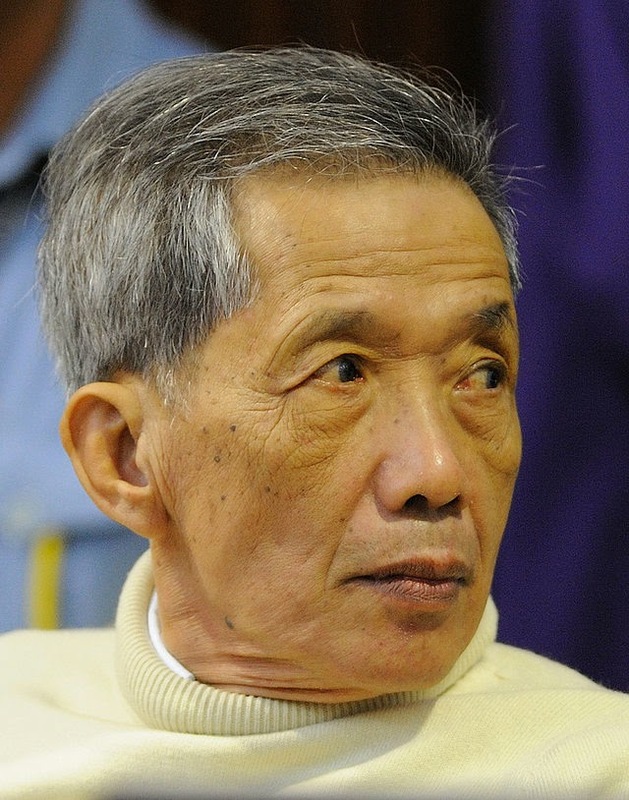 As Pol Pot is already dead, four other top Khmer Rouge leaders will be tried later, after Duch. These include Nuon Chea, former head of the National Assembly, Ieng Sary, former Minister of Foreign Affairs, his wife Ieng Thirith, former Minister of Social Affairs, and Khieu Samphan, former Head of State. Four of the five are charged with war crimes, and all are charged with crimes against humanity. At 9am, there’s a loud electronic beep, and everyone stands. Seven judges file in, all wearing red robes. Two Cambodian guards enter, sitting on either side of the accused. And the proceedings begin. Lawyers do most of the talking, speaking on the slow side to make it easier for translators. Translations are available in Khmer, English and French. I'm impressed by the translations, though it's a very slow process. No wonder these trials are going to take years. Today the lawyers are questioning a witness that spoke refugees that had fled the Khmer Rouge, seeking safe haven in Vietnam. Apparently, the Vietnamese government had forcibly repatriated some refugees back to Cambodia. His testimony is needed, because after those refugees were forcibly returned the Khmer Rouge executed them. As testimony proceeds, Duch agrees with the witness's recollections. Wearing glasses, he looks much like the teacher he was before he joined the Khmer Rouge. As the former prison warden speaks, he waves his hands for emphasis, speaking of the “life and death conflict” between Vietnamese and Cambodian Communists. Duch said, “I didn’t think of Pol Pot as a patriot. He had blood on his hands.” And Duch didn't? I thought that was an odd thing for him to say, since he'd signed thousands of death warrants with his own hand. Later that day, he seemed to correct himself. “My hands were stained with the blood of S-21,” he said. Duch doesn’t deny his part in the genocide. A unique part of Duch's story, is that in the 1990's he converted to Christianity. His conversion seems to have played a role in his confession. He's the only defendant in these trials that is pleading guilty. While we watch the trial, Sue recognizes Vann Nath, a Cambodian sitting behind the prosecutor. He's one of the very few survivors of S-21. His testimony against Duch will be strong evidence. As I watch, Duch speaking animatedly with his hands, I notice something else: he’s missing a finger on one hand. He lost it fighting in the war. I wonder, did having a maimed hand made Duch more brutal? Just about everyone speaks calmly during the trial, until later when a Cambodian lawyer speaks up. He questions Duch heatedly, asking about Cambodians deported from Vietnam. It's stated that Vietnamese officials exchanged buckets of salt for refugees, before they were executed. So Khmer refugees were literally not worth their weight in salt to the Vietnamese government. As the day's proceedings close, the judges exit the court room. As they do, Duch gives each judge a Buddhist bow. How times have changed; he could have been executed for doing that back during the Khmer Rouge days. Months later, Duch's trial finally ends, and he's sentenced to 35 years in prison. Given that he had already been in jail for so long, he would be able to walk free after 18 years. Duch appealed his sentence, saying that he was only a ‘junior officer’ following orders. His appeal outraged victims, and the prosecution, who said the sentence was too lenient. After hearing the appeal, the judges agreed with the victims. Duch was re-sentenced, to serve the rest of his life in prison.